The Oscar Best Picture race may be a real nail-biter this year, but we know what’s going to happen in other categories, right? But here’s something else you can bet on: At some point during the night on Feb. 22, we’ll be surprised. Not by how John Travolta pronounces, say, “Benedict Cumberbatch,” but by who wins what. Upsets are always possible and sometimes almost inevitable, and a year as unsettled as this one is bound to produce a few. So here are five races that just might go in an odd direction, and five people or films who could find themselves unexpectedly on the stage of the Dolby Theatre. Note: I’m not including any possible surprises in the Best Picture category, because that race is so tight that almost nothing would surprise me. Another note: Just because I say these upsets are possible doesn’t mean I think they’re going to happen. I may pick one or two of these longshots to win when I make my final predictions next week, but it’s just as likely that I’ll be going for the favorites in all these categories. I’m just saying that that there could be surprises. Although the Best Actor race is presumed to be a close battle between Eddie Redmayne for “The Theory of Everything” and Michael Keaton for “Birdman,” this is the surprise that might be least surprising, because it’s been frequently mentioned as a possibility. That’s because while Redmayne and Keaton have been squaring off at one awards show after another for the last month — the Golden Globes, the Critics’ Choice Movie Awards, the Screen Actors Guild Awards, BAFTA — they have never been on the same ballot with Cooper. “American Sniper” was released too late in the year to be seen by the SAG Nominating Committee, meaning that Cooper’s physically transformative performance hasn’t really been a factor until the Oscar voting. We know how much Oscar voters love transformations, and we know how much attention “American Sniper” has garnered (and how much money it has made) in recent weeks. That makes Cooper, riding his third consecutive Oscar nomination, a powerful wild card indeed. “The Grand Budapest Hotel” tied with “Birdman” for the most Oscar nominations, nine, and it’s considered the favorite to win in categories like Production Design and Costume Design. But when it comes to the more high-profile categories, writer-director Wes Anderson is likely to have the best shot in Best Original Screenplay, where he stands a good chance of beating “Boyhood” and “Birdman” in a brutally competitive category. But what about Best Director? “Budapest” has been a real sleeper this awards season, and affection for it is enormous. In contrast to the Best Picture category, where the preferential vote-counting system makes it almost impossible for two films to “split the vote” and a third to steal the victory, the director category is far more straightforward: you vote for one candidate, and the guy with the most votes wins. A split vote could conceivably allow Anderson (or Eastwood, for that matter) to score a big surprise here. In all the pundits’ polls, “How to Train Your Dragon 2” is seen as a prohibitive favorite in this category. And it did win the top honor at the Annie Awards, the top honor in the animation field, where it went head-to-head against “Big Hero 6.” But in recent years, the Annies have been kinder to DreamWorks Animation’s films than the Academy has: “Shrek” won the first animated Oscar ever, in 2002, but DWA hasn’t returned to the winner’s circle since then. And in a couple of key contests, the BAFTAs and the Critics’ Choice Movie Awards, the battle between “Dragon” and “Hero” was complicated by the presence of “The Lego Movie,” which won. With “Lego” surprisingly out of the picture at the Oscars, could Academy voters opt for Disney/Pixar for the ninth time, instead of DreamWorks for the second? Yes, they could. “Citizenfour” feels as if it’s the most important film, and the timeliest, and it has swept all the other doc awards. 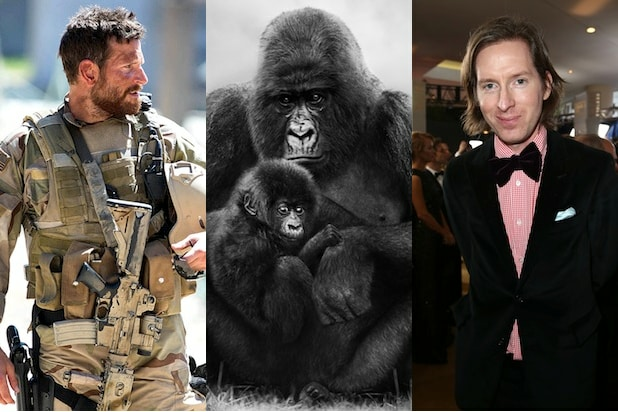 Most likely it’ll win the Oscar, too — but particularly with a third act that is seen by many as the film’s biggest weakness, could it be vulnerable to “Virunga,” the film that packs a bigger emotional punch? Yes, it could: With a story that both tugs at your heartstrings and awakens social outrage, and with a huge push by Netflix behind it, “Virunga” has some late momentum. It’s hard to say that there could be a real surprise in the foreign-language category, where “Ida” is the presumed leader in a close race that could go to almost any of the nominees. Under the old rules that restricted voting to members who’d seen all five nominees in a theater, “Wild Tales” would have a real shot – the black Argentinian comedy has played like gangbusters in front of audiences from Cannes to its official Academy screening. But most Academy voters will likely be watching these nominees on the screeners they’ve received from the Academy – and at home on DVD, “Wild Tales” could well lose a little of its impact. So could another top contender, “Leviathan,” which might require a bit too much patience from viewers who are surrounded by potential distractions. That could help “Ida,” which plays well on screeners. But it could also help “Timbuktu,” which packs a real punch in the way it chronicles a village taken over by inflexible Islamic fundamentalists. And given the news coming out of the Middle East about ISIS, Mauritania’s first-ever submission could appear to be the right movie at the right time.